The Partner visas (subclasses 309 and 100) allow the partner or spouse of an Australian citizen, Australian permanent resident or eligible New Zealand citizenlive in Australia. Obtaining the permanent Partner (Migrant) visa (subclass 100) is a two stage process. 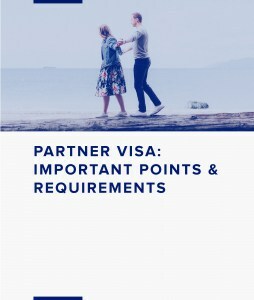 To be eligible for a permanent partner visa you first need to be granted a temporary Partner (Provisional) visa (subclass 309). You apply for both the permanent and temporary visas at the same time and pay only one fee. If you are granted the temporary Partner (Provisional) visa (subclass 309), you are eligible to be assessed for the permanent Partner (Migrant) visa (subclass 100) about two years after you lodged your application. You will need to provide further documents for this assessment. If you have been in a long term relationship before you lodge your application, the permanent Partner (Migrant) visa (subclass 100) will be granted immediately after the temporary Partner (Provisional) visa (subclass 309). If, at the time you apply, you have been in a long term relationship with your partner, your permanent Partner visa (subclass 100) will be granted immediately after the temporary Partner visa (subclass 309). If you are married, usually you must be 18 or older when you apply. This is because usually, you must be 18 or older for your marriage to be valid under Australian law. If you are a de facto partner, you must be 18 or older when you apply. You must be the spouse (married) , or a de facto partner of an Australian citizen, Australian permanent resident or eligible New Zealand citizen. You might still be eligible if your relationship breaks down after you lodge your application. You must have a sponsor, who will be your partner, except if your partner is under 18 years of age. have complied with all Australian laws whilst on your temporary visa. You pay only one fee, which covers the permanent and the temporary visa, and you pay this when you lodge your application. In most cases, visa application fees can not be refunded, even if you withdraw your application, or your visa is refused. There is a fee for any children applying for the visa with you. If you need to have them, you will have to pay other costs such as those for health checks, police certificates and biometrics. You must be outside Australia when you lodge your application and when a decision is made on the temporary Partner visa (subclass 309). You can be in or outside Australia when a decision is made on the permanent Partner visa (subclass 100). The Partner (Provisional) visa (subclass 309) is a temporary visa. It lasts from the date it is granted until a decision is made on your permanent Partner visa (subclass 100). The Partner (Migrant) visa (subclass 100) is a permanent visa – it lasts indefinitely. It starts on the date it is granted. If you are granted the visa, your children will have the same rights and visa conditions as you. You and your children must comply with Australian laws and your visa conditions. Usually, a sponsor is the husband, wife or de facto partner of the applicant. You might not be able to be a sponsor if you hold or have held certain visas and certain circumstances apply to you. Your sponsorship ends two years after your partner first enters Australia on their temporary Partner visa (subclass 309). This is the case even if the permanent Partner visa (subclass 100) is granted immediately after the temporary subclass 309 visa is granted.